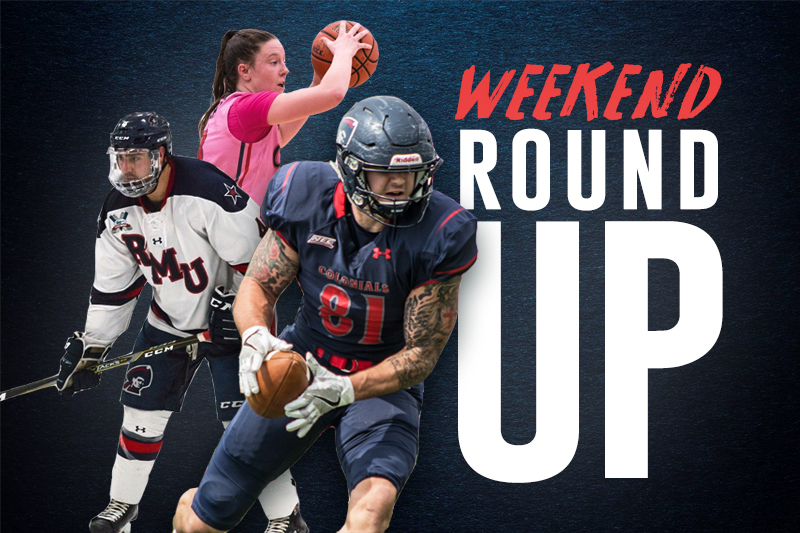 MOON TOWNSHIP — In case you missed it, here is what happened last night as RMU women’s basketball traveled to face LIU Brooklyn in Brooklyn, N.Y.
RMU women’s basketball (7-8, 4-0 NEC) blew the LIU Brooklyn Blackbirds (1-14, 0-4 NEC) out of the water on Monday night as they won by a record-breaking margin with an 89-37 win. It was the largest road win in the program’s history. The Colonials immediately jumped out to a 12-0 lead to start the first quarter. It wasn’t until after that the Blackbirds were able to pick up their first points of the game when Blackbirds player Brandy Thomas scored two points on two consecutive free throws. RMU continued to give LIU Brooklyn a hard time when Isabella Posset scored with a jumper, a layup and free throw from Irekpitan Ozzy-Momodou, a three-pointer from Natalie Villaflor and a jumper from Esther Castedo to end the first quarter with a 22-10 lead over the Blackbirds. Robert Morris started the second quarter with an 11-point run to sink the Blackbirds more and put up a 34-10 lead. The Colonials continued to put a large margin in the Blackbirds’ faces, going as far as a 27-point lead in the second quarter made on a layup from Castedo in the paint to be up 43-16. RMU finished up the second quarter with a 43-17 lead after Jeydah Johnson scored a point for LIU Brooklyn on a free throw. In the third quarter, RMU put LIU Brooklyn out of their misery by a drastic margin. The team’s started the quarter when LIU’s Kiara Bell scored on a layup for the score to be 43-19. After that, RMU went on a five-point run to put themselves up 48-19 after Nadege Pluviose scored a three-pointer and Nneka Ezeigbo hit two free throws for the Colonials. After LIU scored a couple free throws, RMU began running wild, as they scored consecutively to start off a 16-point run and led LIU Brooklyn 64-21. LIU’s Ryan Wiese scored a three-pointer and Robert Morris’ Castedo scored an additional two points on a jumper to end the third quarter 66-24. The final quarter was similar to the third quarter as RMU started the fourth quarter with a 13-point run that got topped off with a jumper from Ezeigbo. LIU scored after that to eventually catch up to an 89-36 RMU score. LIU’s Wiese finished off the game with a free throw to put RMU victorious with an 89-37 win. Robert Morris continues their road trip on Saturday when they visit the Bryant University Bulldogs (4-11, 2-2 NEC) at 1 p.m. to try and extend their winning streak in Northeast Conference play.